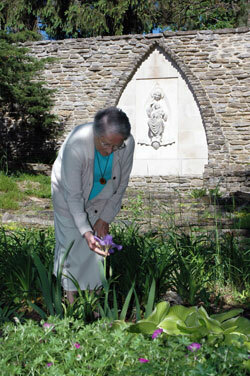 Purple irises bloomed tall and proud in the rock garden inside the high stone walls of the Carmelite Monastery of the Resurrection at 2500 Cold Spring Road in Indianapolis. The Carmel was founded in 1922 in New Albany by Mother Theresa Seelbach, the former Emma Seelbach, with a $2,000 check from her family, who owned and operated a hotel in Louisville. The cloistered nuns purchased land and moved to Indianapolis a decade later then began a 29-year building program. The last wing of the monastery and the chapel were completed in 1961. 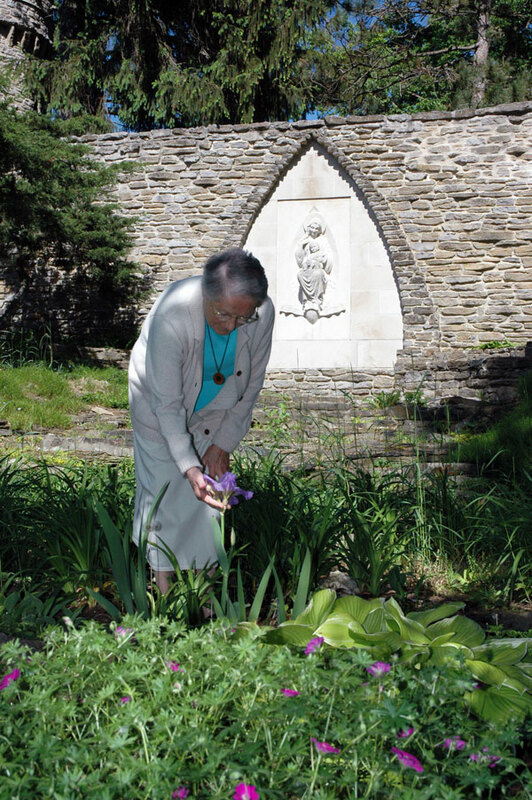 An occasional bird call broke the stillness on the scenic grounds near a small stone hermitage as Sister Jean Alice talked about the emotional days ahead for the nuns, who are busy packing most of the community’s belongings. They will leave several large crucifixes and a carved stone statue of Our Lady of Mount Carmel as well as religious books for the archdiocesan seminarians who will move into the monastery later this summer. The sisters are grateful that their fortress-style monastery and chapel on 17 acres of land near Marian College will continue to be a place of prayer and Christian formation as the new home of the archdiocese’s Bishop Simon Bruté College Seminary. It is a holy place, a sacred space, and it pleases the nuns that God will still be honored there during daily Mass in the chapel and the Liturgy of the Hours prayed in the seminary. Before her sentimental tour of the monastery and grounds, the prioress joined three nuns in the dining room for tea and conversation about their life of contemplative prayer and seven decades of ministry in Indianapolis. Sister Teresa recalled with fondness the Carmelites’ prayer novenas on the monastery grounds, which drew as many as 5,000 people to pray with the sisters in years gone by. In the Carmelite tradition, Sister Jean Alice explained, prayer is a continuous relationship with God, who loves us. “I think as we spend time—sometimes long periods of time—just concentrating on that relationship [with God],” she said, “then that overflows into our daily lives, which involve doing things like everybody else does. But, eventually, I think you begin to pray your life. Life becomes a prayer. During Mass, Carmelite Sister Ruth Boyle explained, the priest reminds people that they are entering into the presence of God. Carmelites focus on being in God’s presence throughout every day, she said, not just during liturgies. The architecture of the monastery offers opportunities for prayer at every turn, Carmelite Sister Betty Meluch explained, not just in the chapel or the small prayer cells with arched doors and windows or the outdoor hermitage. Sister Jean Alice said the nuns see their ministry as one of prayer and community which supports God, and their cloistered, contemplative lives as their witness of love for and faithfulness to God. To earn income for their living expenses over the years and supplement donations, the nuns baked altar bread, sewed vestments, created ceramic vessels, typeset and published books, and most recently managed a prayer Web site at www.praythenews.com, which was named by Sister Betty. The nuns will “retire” their electronic prayer ministry and remove their Web site from the Internet when they move to Oldenburg with Lucy, their black Labrador Retriever, at the end of June. Every decision that the nuns make is discerned through prayer as a community, the prioress said, based on their Carmelite spirituality. Sister Jean Alice said the teachings of Christ, St. Teresa of Avila and St. John of the Cross will help sustain them during their new beginning in the historic “Village of Spires” in southeastern Indiana. The nuns said they see many blessings and benefits in their move to the grounds of the Oldenburg Franciscans’ motherhouse. Their Carmel was founded by Mother Theresa Seelbach, and the foundress of the Sisters of St. Francis of Oldenburg was Mother Theresa Hackelmeier. They will live on the first and second floors of Theresa Hall, which was named as a tribute to Mother Theresa and St. Teresa of Avila.